In deep bowl mix all marinade ingredients. Marinate at least 2 hours. Remove from marinade and cook over medium-high heat on greased grill for no more than 15 minutes or until done. Cooking time for second side is shorter by 1-2 minutes. 3/4" or thinner, 5-6 minutes maximum per side, thicker than 3/4" 6-7 minutes maximum per side. DO NOT OVER_GRILL, chops will become tough. 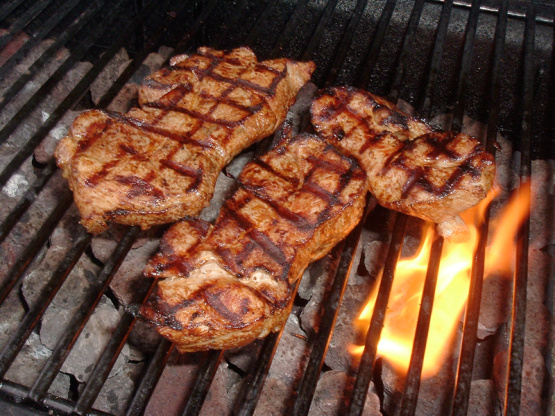 After 2 minutes grilling on a side, rotate chops 45 degrees for even cooking. Turn over when juices pool on upper surface and meat appears to be cooked half-way through.